Venkatsubbarao Ganesh Karnad was born in 1925 in South Kannara, a district that grows bamboo reeds abundantly. V.G. Karnad, popularly known as Narahari, had a natural aptitude for music. Although he was discouraged from studying music, he acquired proficiency on the harmonium and the flute during his youth. 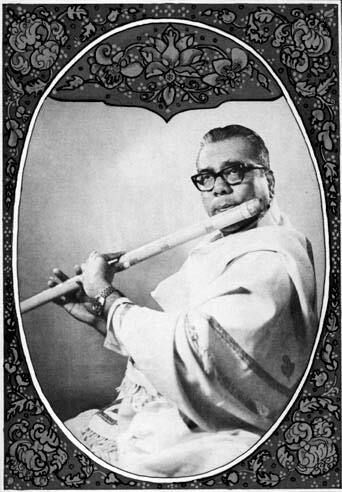 Young Narahari was quite influenced by the Karnataka style of flute playing of the famous P. Sanjivrao and tried his hand in flute making too. Thus began the long odyssey of crossing the proverbial seven rivers to meet his guru-to-be, Pandit Pannalal Ghosh. It was not until he came to Bombay as a young man of twenty-three that he had the opportunity to approach Pannalal Ghosh, who by that time was recognized as peerless among North Indian flautists. Pannalal Ghosh agreed to teach Karnad and told him that he did not accept fees from his disciples, but expected them to pay him with pure, good music. Then began a period of intensive training. Karnad had to put aside whatever he had learned before and mold his playing according to the new techniques of the 7-holed flute. As he progressed he was able to handle the bigger flutes such as his guru played and would accompany him during performances. Expert tutelage and rigorous practice, combined with a profound reverence for his guru, has moulded Karnad into an accomplised artiste. His deft fingers coax out of his bansuri music in all its richness of idiom and serenity of expression. A radio artiste since 1954, Karnad's talents were noticed by critics and cognoscenti after his performance in the Sur-Sringar Samad's Swami Haridas Sangeet Sammelan in 1958. Karnad is also no stranger to music concerts and TV. Pt. V.G. Karnad performing before a painting of his guru, Pt. Pannalal Ghosh, at the late Panna Babu's house in Malad, Mumbai on the occaision of Panna Babu's punyatithi (death anniversary). Pt. Omkar Gulwady is accompanying on tabla. Karnad is recognized today as outstanding among North Indian flautists. As a senior disciple of Pannalal Ghosh, he is one of the few recognized as a true representative of the style of his guru. He is wholly dedicated to the art, to maintaining its purity and sharing his knowledge with others. He has also performed extensively during a tour of European countries in 1960. In the year 1982, Karnad made a visit to the UK and USA, where he gave 45 concerts and all were widely appreciated by the connoisseurs. In 1986, one of the senior most Guru-bhais of Karnad from Dhaka, Bangladesh, invited him to perform in a programme organized to commemorate the 75th birth anniversary of their guru, the late Shri Pannalal Ghosh. Karnad earned a lot of appreciation and accolade as a worthy disciple of the great flute maestro. Two-three flautists of Bangladesh also became his disciples and make frequent visits to India to have flute lessons from him even today. Following this, Karnad made two more visits to Bangladesh in 1987 and 1992 when he entertained the music lovers of Chittagong, Rajashahi and in a few cultural organizations of Dhaka. During 2011, the birth centenary year of late Pt. Pannalal Ghosh, Pt. 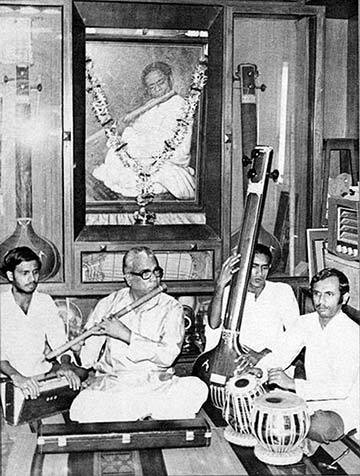 Karnad performed in several music programs arranged in memory of his Guru. Pt. Karnad concluded with his flute recital a grand 3-days music festival at Dhaka (Bangladesh), jointly hosted by the ARK Foundation and the Great Heritage Trust, marking the 100th birth anniversary of the legendary flautist Pt. Pannalal Ghosh. On this occasion, he was also felicitated with the hands of Mr. A.B.M. Khairul Haque (Chief Justice, Bangladesh) and Dr. Dipu Moni (Foreign Minister, Bangladesh). Pt. Karnad has summarized his lifetime experiences in his autobiography “VenuGandh”. At the age of 91 years, he continues to give free tuitions as a missionary act to those genuinely interested in flute, and freely distributes the knowledge he received from his Guru. Read an interview with Pandit V. G. Karnad, recalling his studies with his guru, Pandit Pannalal Ghosh. Pt. 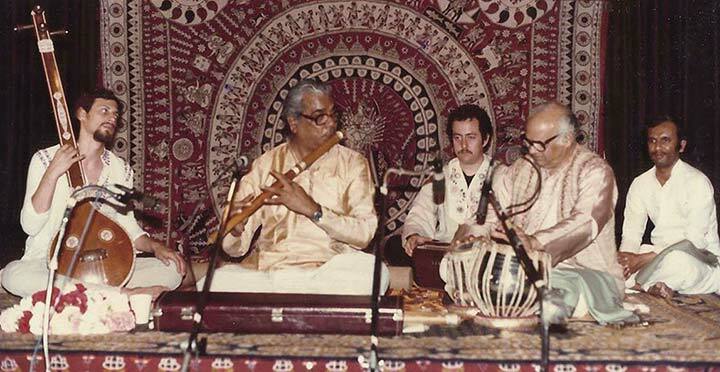 V. G. Karnad performing with Pt. Taranath Rao in Los Angeles, CA - 1982. David Philipson accompanies on tanpura, Jef Feldman playing swarpeti, Pt. Omkar Gulwadi providing moral support.